Print Squishy Objects! New Improved Elasto Plastic Available for Makers at Shapeways #3dthursday « Adafruit Industries – Makers, hackers, artists, designers and engineers! We’re excited to announce the launch of our first ‘Maker Only’ material: a flexible, rubbery plastic called Elasto Plastic! The finish, color, and properties are not yet ready for sale to a wider audience, but it’s a perfect material for any Maker out there who can work with a textured surface and maybe a little extra powder arriving with their model. 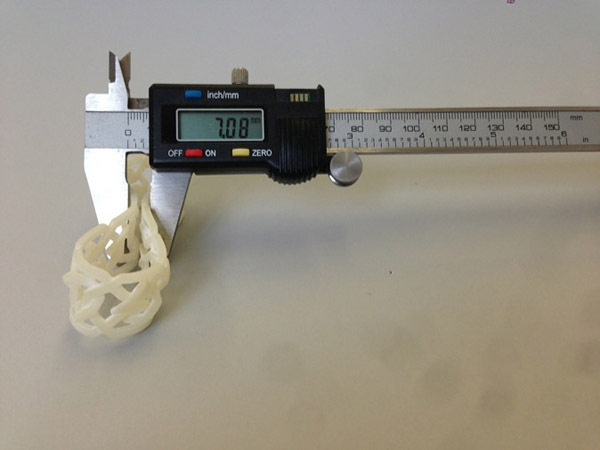 The new, improved Elasto Plastic is a great option for Makers as it is an incredibly durable material with a lot of really interesting properties such as high impact resistance, flexibility and compression (depending on the geometry), along with a high level of static friction because of the surface texture. Though not strictly water-tight, it can hold liquids, but it does not like high temperatures or fire. It is a valuable addition to our 3D Printing material options here on Shapeways that we are sure you will find incredibly useful and fun. To all our hackers, tinkerers, and dreamers, this is the start of a new series of materials catered just to you. The models that you submit push the limits of our machines and materials, which in turn inspire us to make improvements to meet your needs. The experiments we see posted on the forum (dyeing your own nylon or testing out surface treatments) help us understand your needs, and often get integrated into our standard processes. We want to continue to work together with our community on material innovation….